Celtic's march to their sixth successive Ladbrokes Premiership title continued but with little excitement in the 1-0 win over Hamilton at Parkhead. Striker Leigh Griffiths prised open a tight Accies defence in the 36th minute with his 11th goal of the season after being set up by strike partner Moussa Dembele. 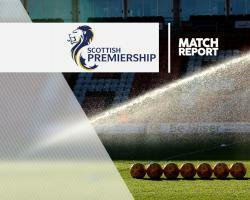 The home side dominated and the Scotland striker, who had made a scoring return to the starting line-up in the 4-1 win at Partick Thistle on Friday, was among several Hoops players who missed opportunities to put a better sheen on the scoreline. However, Brendan Rodgers' side remain unbeaten domestically and moved 11 points clear of second-placed Rangers with two games in hand. Hamilton had been crushed 8-1 when they visited Celtic Park in January and although the game was one-sided, they will have to take some encouragement from the fact this defeat was not as damaging. Accies had drawn their previous five games and 10 in total and publicly proclaimed their desire to rack up another one so there was no surprise as to the direction of play. In the 35th minute Accies skipper Massimo Donati, a former Hoop, weakly headed an Ali Crawford corner into the hands of goalkeeper Craig Gordon, before Celtic defender Jozo Simunovic nodded a Patrick Roberts cross over the bar at the other end. However, all the visiting side's good defensive work was undone when Dembele raced clear of the square Accies rearguard to pick up a Tom Rogic pass and as Hamilton keeper Gary Woods advanced, he unselfishly squared for Griffiths to knock into the net, despite the best efforts of defender Grant Gillespie. Moments later, it was Griffiths who scarpered clear of the Lanarkshire defence only to screw his shot wide of the far post and when he crossed on to the head of Dembele just before the break, the France Under-21 striker headed over from only a yard or two out. The prospect of a Hamilton comeback was slim and Crawford's long-range effort four minutes after the restart was ambitious to say the least, Gordon clutching confidently. Gary Mackay-Steven replaced Callum McGregor in the 58th minute and seconds later Celtic midfielder Stuart Armstrong poked a fine pass from Rogic past Woods but also the post. As the chances mounted up, Dembele had a trundling drive saved by Woods before Mackay-Steven missed a cross from Roberts. In the 75th minute of a game that was becoming increasingly flat, Rogic flashed a 25-yard drive just past the post. The final stages saw Accies open up a little - substitute Eamonn Brophy, on for Rakish Bingham, drove just wide on the break - but it was hardly gung-ho and although the slimness of Celtic's lead led to a few nerves among the home fans, their 10th league win in succession was secured with little more fuss.